Deadpool ftw!!!!!!!!!!! health bar beatdowns jeah!!!!! Last edited by Nasen; 07-21-2010, 05:11 PM. It's been a decade, but Capcom is finally able to offer a sequel to one of its most popular fighting games of all time. Marvel Vs. Capcom 3 is set for a spring 2011 release on PS3 and Xbox 360 and it looks like it will deliver everything fans want. The core gameplay of Marvel Vs. Capcom remains intact, so while there are some changes, any MVC fan can jump right in. We've already detailed a lot of the gameplay changes, so I'm going to put my focus on what is new in the Comic-Con build. There's plenty enough to talk about. The roster for MVC3 is slowly filling out. Four new characters are playable at Comic-Con: Trish from Devil May Cry, Chun-Li, Dr. Doom, and Super-Skrull. There's not a ton to say right now for Dr. Doom and Chun-Li. Doom, in particular, is still very raw and has a lot of work to be done. He's pretty much a carbon copy of the MVC2 version, so here's hoping some new attacks are added in the coming months. Chun-Li is as familiar as ever, except Capcom has increased her speed. I was told she is now, without question, the fastest character in the history of Capcom fighting games. With more than six months of development time remaining, balancing could slow her down a bit. For right now, she's as fast as lightning, making her feel a bit floaty because she's just so fast. Trish is an interesting addition and a nice pairing with Dante. While Dante is astonishingly good in close-quarters combat, Trish is best used at range. She's the type of character that experts will use to frustrate novices. The trick is getting in close, where she is relatively helpless. But Trish has a few moves to keep your fighters at bay. Trish can lay a series of magical traps--in the air and on the ground--that zap an opponent with energy as soon as they cross it. If Trish takes a hit, the traps disappear. You can also punch traps in the air, which is kind of surprising when you first see it. I'm going to need more time with Trish before I can say she's someone who would be backing my crew. She has a few cool attacks--including a boomerang-type weapon that seems pretty effective--but I'm more into the close-combat folks, not the dink-and-dodge type. Super-Skrull is more up my alley. Like Trish, he's still in the early stages so a lot more is coming. But what Capcom has so far is pretty promising. Super-Skrull possesses the powers of the Fantastic Four, including Mr. Fantastic's stretching abilities, the Human Torch's hot streak, the Invisible Woman's bubble shield, and The Thing's rock-hard mitts. He has an unblockable grab move that has a bit of range. Super-Skrull grabs a fighter, using his stretching powers, then slams them repeatedly into the ground. Any time you block, it brings up the bubble shield. That's the only Invisible Woman power for now, but more will be added. His best Level 1 super move has the Skrull coil into a ball of flame and spin forward, sending out a gnarly blast of heat at his opponents. All-in-all, Super-Skrull is a great addition. He's already fun to play and with more moves coming, he should get even better. As for the previously revealed characters, there are some new things to discuss. The main thing being the addition of Level 3 supers. For MVC3 there are only Level 1 and Level 3 supers, but as you attack or take damage, you fill your super meter up to five levels. How you dish out those levels is part of the strategy. The Level 3's are worth saving for. Chris Redfield's Level 3 has him calling in a satellite laser strike a la Resident Evil 5, with you controlling where the satellite fires. Iron Man's Level 3 is fantastic to behold. He slams into the opponent, rips across the ground with them, then shoots up into the air, leaving the other fighter defenseless. As Iron Man loops back around, he unleashes a punishing repulsor blast from his chest. Deadpool's Level 3, though, is my favorite. He puts what can best be described as a hex on a fighter and if they are foolish enough to strike, he counters with a series of lovelorn air-smooches and ridiculous strikes (like swinging a giant metal beam as if it were a bat and you were a softball). Best is the taunt at the end: "This is a hyper-coooombo!" But for all the new stuff, the thing that got me oohing most was Ryu's ability to aim his Hadouken super move. The Level 1 super has Ryu firing a straight blast of blue energy forward. Nothing new there. Except now you can move Ryu's aim as he fires, tracking enemies--even shooting straight up. The first time I did this, I totally caught Ryan Clements by surprise, knocking him out of the air and making him cry. No, really, he cried salty tears of sadness. Also debuting at Comic-Con are two new stages. One is on the deck of the SHEILD Helicarrier during a nighttime battle in New York harbor. You can see a full-scale battle taking place in the background. The other is set in a Resident Evil laboratory, with lickers growing in vats behind you during the fight. If you perform a smash move near the vats, you can actually destroy them, setting the lickers free. They don't influence combat in any way, but if you smash again near the lickers, you kill them--and they leave behind Resident Evil power-ups (like first-aid spray). They don't seem to help at all, but it is a pretty cool visual. 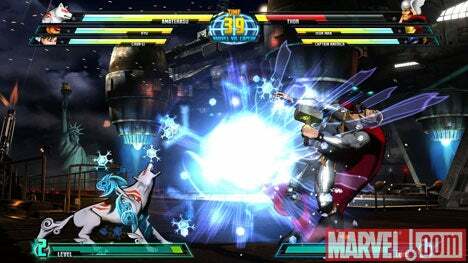 Marvel Vs. Capcom 3 still has a lot of development time to go, but already it's looking incredible. All it needs now are the additions of Dazzler and Phoenix Wright. Oh, and about 30 other characters. Rumor has it, a few more may be revealed during the week. So keep your eyes on IGN.com for the latest details. Tone, please tell me you're going to buy this for the PS3. 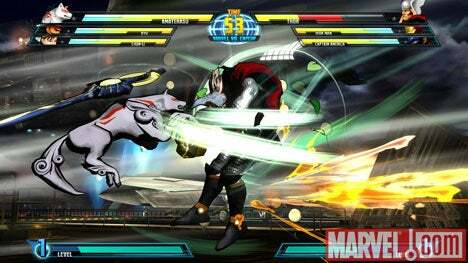 More fighters have been confirmed for Marvel Vs. Capcom 3. 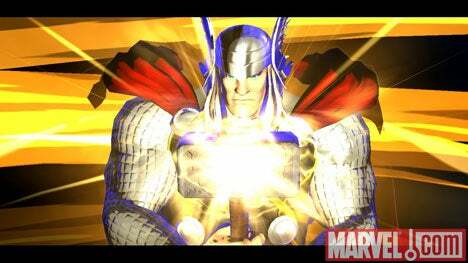 Images posted on Marvel's website tonight confirm The Mighty Thor and Amaterasu, the star of 2006's PlayStation 2 hit Okami, have been added to the growing collection of stars. These two characters have yet to be officially announced by Capcom, however. The images include both in-game screenshots and character art, so they are legit. Four fighters were introduced this morning, and with the addition of Thor and Amaterasu, the total count of revealed characters has reached 16. 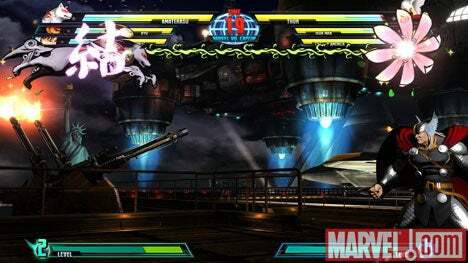 Hit up the screens below and be sure to check out our latest preview of Marvel vs. Capcom 3 from Comic-Con.